Clemson dominated Notre Dame and it reaffirmed the double-digit point spread. A look at all the action in our College Football Playoff betting recap. With double-digit point spreads in both College Football Playoff semifinals, bettors have wondered for a month of if those numbers were justifiable. However, Clemson dominated Notre Dame at the Cotton Bowl to reaffirm why there are two clear favorites and we'll take a look at all the betting action in our College Football Playoff betting recap. 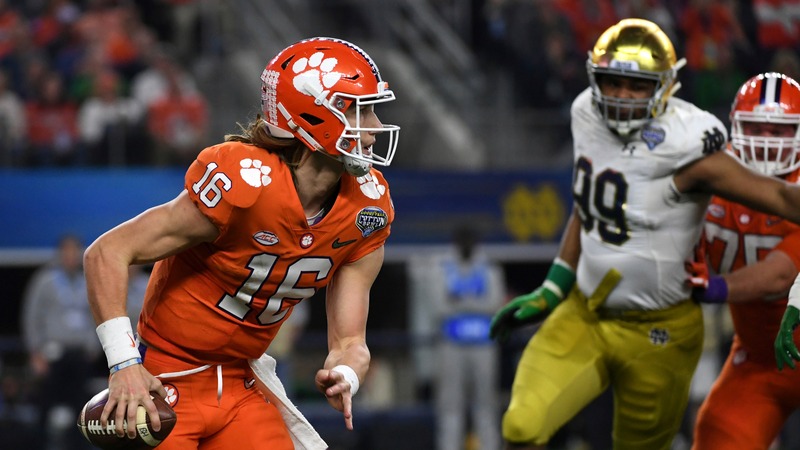 ## Clemson annihilates Notre Dame For about a quarter, it looked like the Fighting Irish defense was too good for Notre Dame to close as a 10.5-point underdog in Dallas on Saturday night. However, Clemson stepped on the gas in the second quarter and showed the nation why they belong in the conversation with Alabama for top program in the country. All season long, true freshman quarterback Trevor Lawrence has made good as the consensus No. 1 recruit in the nation for the Class of 2018. However, he was still viewed as a potential weak link in his first taste of College Football Playoff action against an elite defense. And while it took him a quarter to adjust, Lawrence answered any questions about his ability to lead Clemson to a championship beginning with a great throw down the seam for a 52-yard touchdown to fellow true freshman Justyn Ross. Just over 11 minutes of game time later, Lawrence hit Ross again for a 42-yard touchdown that signaled the route was on. Lawrence finished the day with 327 yards and three touchdowns on 27 of 39 passing. Meanwhile, the Clemson defensive line controlled the game at the line of scrimmage, limiting the Irish to 248 yards of total offense. That was music to total bettors' ears, as Clemson holding Notre Dame to just three points aided a comfortable UNDER cash. However, according to VegasInsider.com, only 27 percent of [total tickets ](http://www.vegasinsider.com/college-football/odds/betting-trends/notre-dame-@-clemson.cfm/date/12-29-18)were on the UNDER despite two top-10 scoring defenses going head-to-head and a total that closed at 58. The Tigers will now move on to the College Football Playoff National Championship and it will be interesting to see how Saturday impacted their perception among oddsmakers. Prior to conference championship week, Alabama was [projected](https://www.betchicago.com/cfp-2019-odds-betting-lines-clemson-alabama-potential) to be a 7.5-point favorite over Clemson in a potential title showdown. __Play to win:__ [Enter our free contests for great prizes like Bears playoff tickets and even cash! ](https://betchicago.chalkline.com/) ## Oklahoma offense salvages cover but Alabama still rolls At the end of the day, Oklahoma backers won't care about the route that the Sooners took to covering as 14.5-point underdogs against Alabama at the Orange Bowl on Saturday night. However, the Crimson Tide were still in control of the action all night long and it will be interesting to see if they're credited for that moving forward with a title match set against Clemson. Alabama raced out to a 28-0 lead in the first 17 minutes of the game and looked like they might destroy Oklahoma in the sort of fashion that would change opinions in a lot of ways. However, the Oklahoma offense found their rhythm and Kyler Murray put together a second half that got Oklahoma back to within arm's length to earn the cover. As at least a 14.5-point favorite in every game this season, Alabama has had a tendency of getting run down late by their opponents because of they take their foot off the gas after amassing a large lead. However, they've covered the first-half spread in 13 of 14 games this season, so that might be a play worth monitoring against Clemson with that line likely coming in at around a field goal.